In early October, wildfires ripped through California’s renowned wine country, displacing more than 10,000 in Napa and Sonoma Counties alone, and wiping out entire neighborhoods and businesses. Today, we know it was the most devastating wildfire event in California’s history. Camille White of Venn Floral helps place arrangements down the long table for Tuesday’s event. Photos by Visit CA and Max Whittaker, Freelance Photojournalist. But on Nov. 21, just days before Thanksgiving, California flower farmers, a team of volunteer floral designers led by Venn Floral of Sebastopol and the California Cut Flower Commission (CCFC) joined forces with industry partners Visit California and California Grown to support a farm-to-fork style feast for over 500 guests to benefit wine country wildfire recovery efforts. 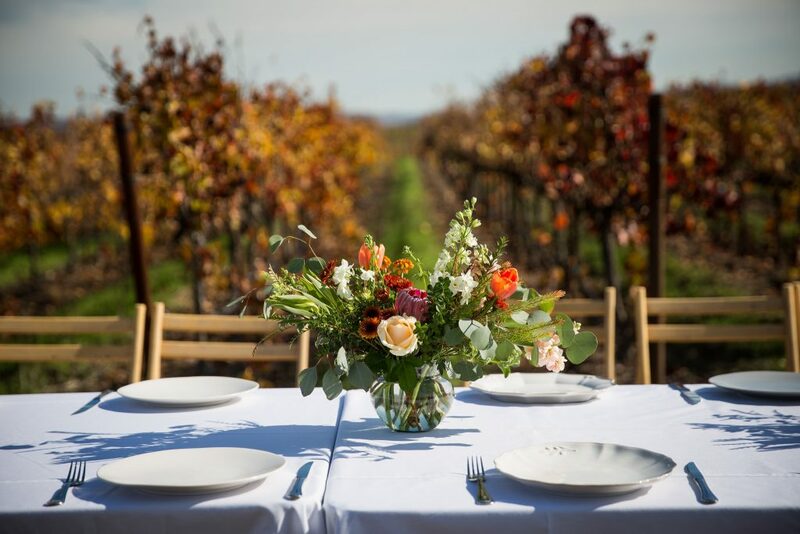 Hosted by Visit California, The Grateful Table featured celebrity Chef Tyler Florence in partnership with farm dinner event company Outstanding in the Field. 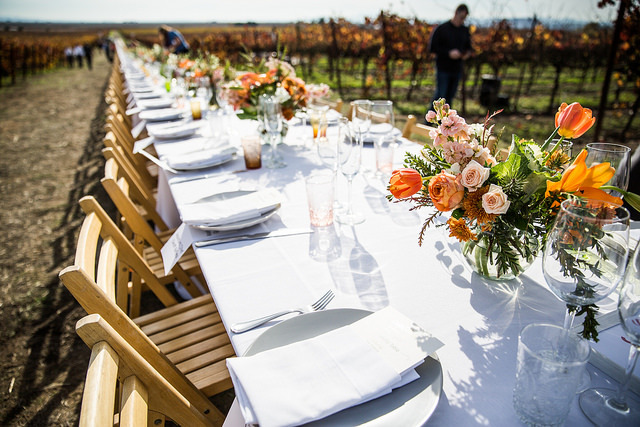 The CCFC, with its experience managing the national American Grown Field to Vase Dinner Tour, was tapped by Visit California to assist with the design and execution of the floral tablescape for the event. 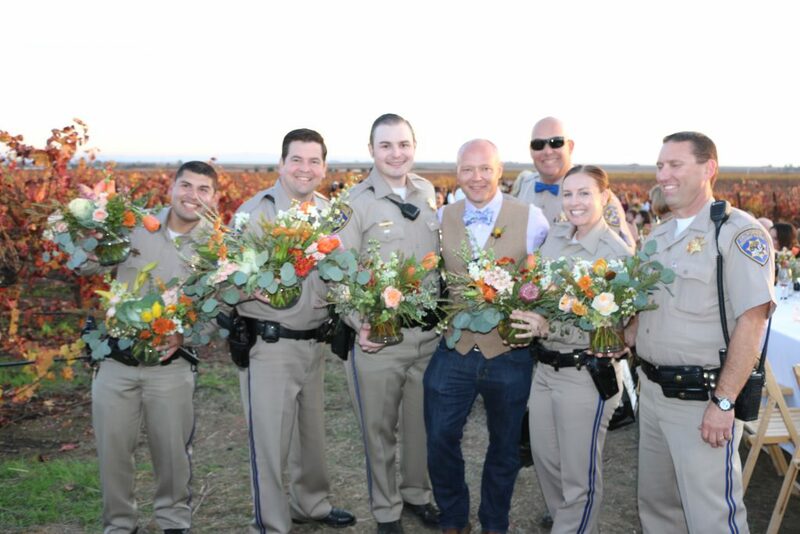 California flower farmers sent thousands of flowers for the special fundraising event. Photos by Visit CA and Max Whittaker, Freelance Photojournalist. 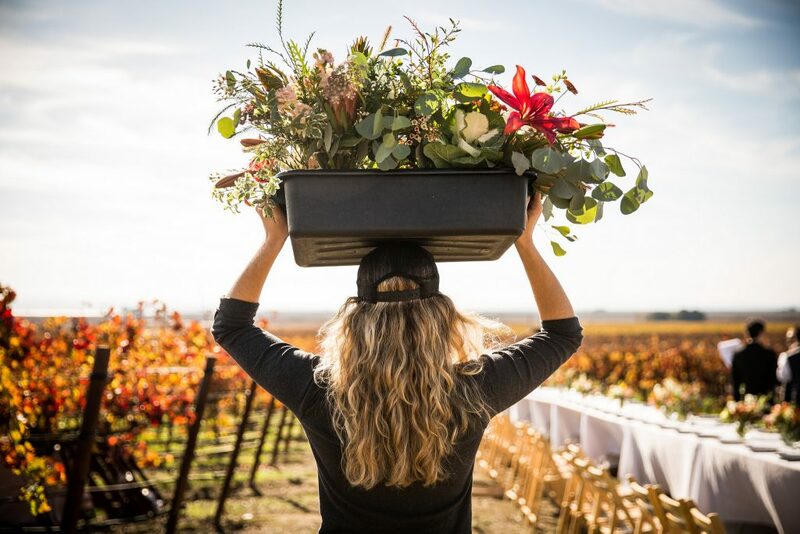 Working with Heather Frye and Camille Rowan of Venn Floral, a tablescape was created based on thousands of flowers donated by California’s flower farmers. Resendiz Brothers Protea, Sun Valley Floral Farms, Holland America Flowers, Green Valley Floral, Joseph & Sons, Ocean View Flowers, Camflor Inc., Mellano & Company, CallaCo, Westland Floral, Pajarosa Floral and Kitayama Brothers all responded to the call for donations amidst a busy Thanksgiving holiday rush on flowers. CCFC CEO & Ambassador Kasey Cronquist with first responders who were honored during Tuesday’s event and presented with flowers for their heroic efforts during the deadly wildfires that swept through the region. Photos by Visit CA and Max Whittaker, Freelance Photojournalist. Torchio Nursery and Jessup Transportation provided logistics support for this effort. And Syndicate Sales provided all of the vases for the event. 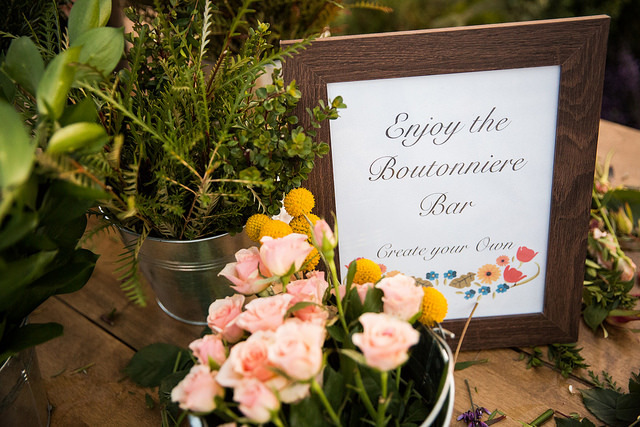 Guests were invited to create their own boutonnieres to wear during the event. Photos by Visit CA and Max Whittaker, Freelance Photojournalist. Photos by Visit CA and Max Whittaker, Freelance Photojournalist. 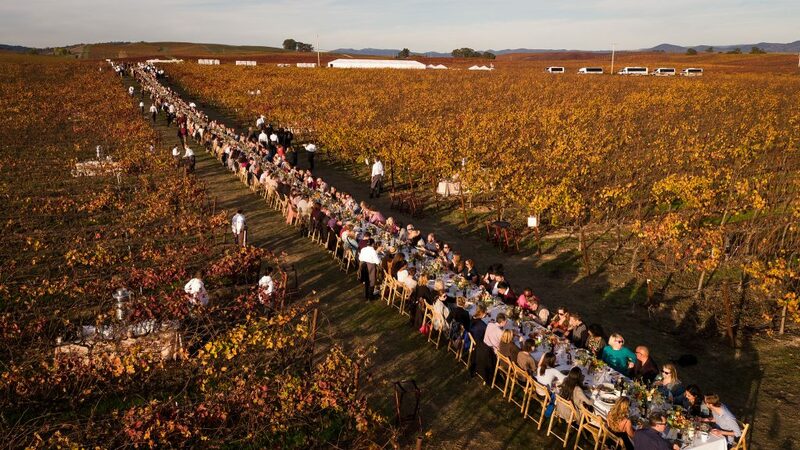 One hundred percent of proceeds raised from sales tickets to the feast will support nonprofits that are helping those affected by the wildfires in California’s iconic wine country. And among the guests at the event were people who had lost their homes as well as first responders. 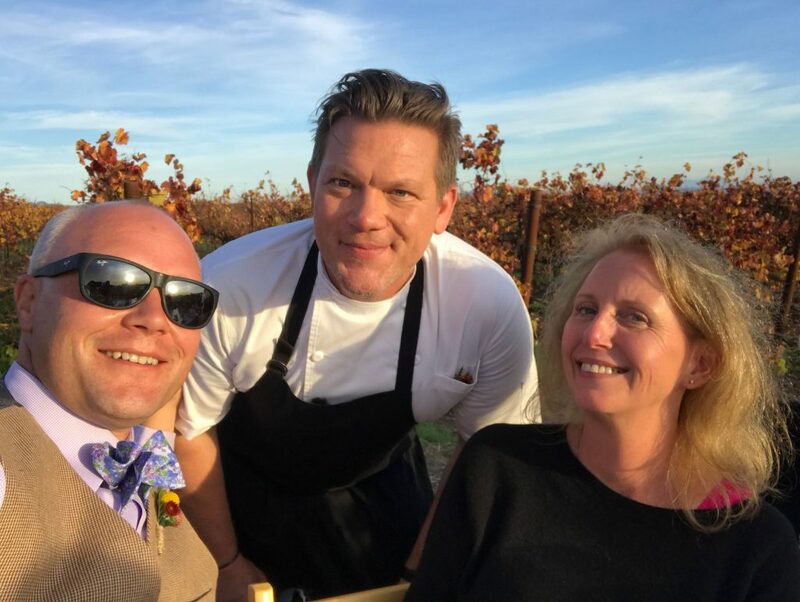 CCFC CEO & Ambassador Kasey Cronquist and CCFC Chair Diana Roy with Chef Tyler Florence.Photos by Visit CA and Max Whittaker, Freelance Photojournalist. 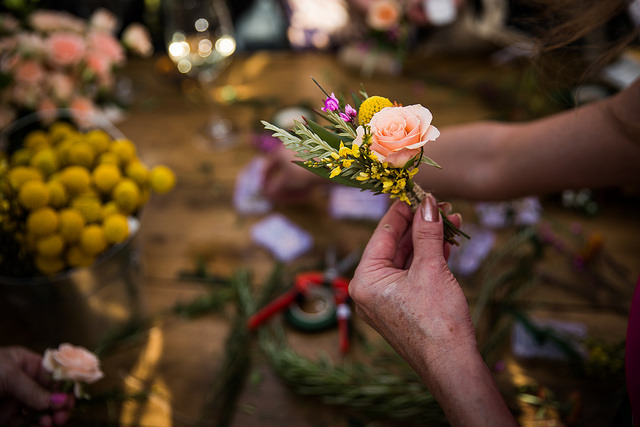 It was also a way for flower farmers and designers to lend their resources and talents to a worthy cause. A beautiful tablescape was designed and beautifully executed by Heather Fry and Camille White of Venn Floral. Photos by Visit CA and Max Whittaker, Freelance Photojournalist. Over 500 people attended the event, which required 63 tables for the pop-up farm to fork dinner. The dinner table ran right down the Napa & Sonoma county lines. Photos by Visit CA and Max Whittaker, Freelance Photojournalist.